Cast Loop is the second newest puzzle in the Hanayama Cast series of puzzles, designed by Finnish puzzle designer Vesa Timonen based on an original puzzle ring he created for his girlfriend. It is available from Puzzle Master along with many more puzzles from the Hanayama cast series. The object of the puzzle is to create a closed loop. Thanks Puzzle master for sending me this puzzle to review. 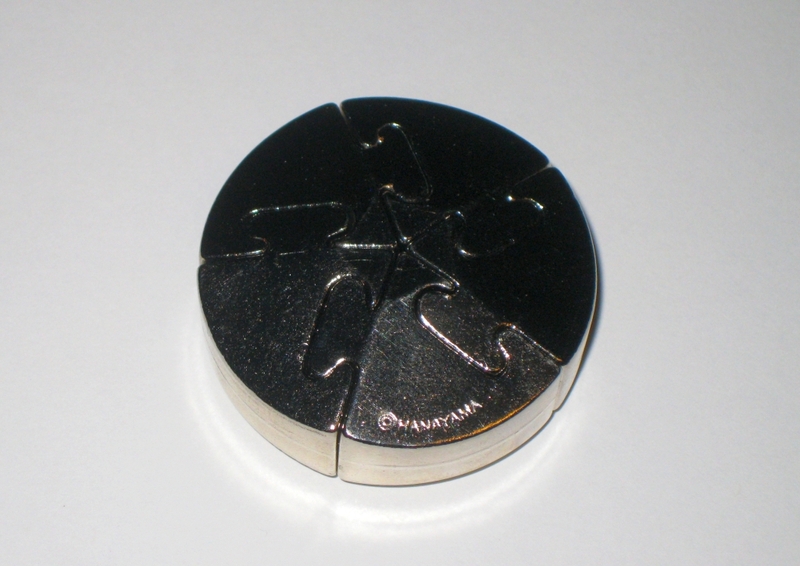 The puzzle is packed in the standard Hanayama black and gold packaging, and is held in the box in the position seen above. By shipping it this way, you're not given any clues as to how to solve the puzzle, as separating the pieces doesn't show you how to solve it. If anything it may mislead you, and trick you into not seeing the solution. Quite a clever way to package the puzzle. It also ships with a leather thong, so that once solved, the puzzle can be worn as a necklace. It does hold together well, so this would be a possibility, but we'll get to that. This is a great looking puzzle, with the chrome plated finish really making the puzzle stand out. The puzzle is around 2 3/4" in diameter so sits nicely in your hand, and being a cast puzzle has a solid weight to it. This really feels like a high quality puzzle. Taking the puzzle apart, you're left with what looks like two mirror image pieces. The magnets on the angled ends are strong enough to hold the puzzle pieces firmly together, so there's no worries about the puzzle accidentally coming apart once solved unless you want it to. To that end I think it would be possible to wear the puzzle as jewellery, just don't expect to see me wearing it any time soon. One of the things I love about this puzzle is the symmetry when solving it. Even though there are minimal moves needed, the puzzle looks great throughout. 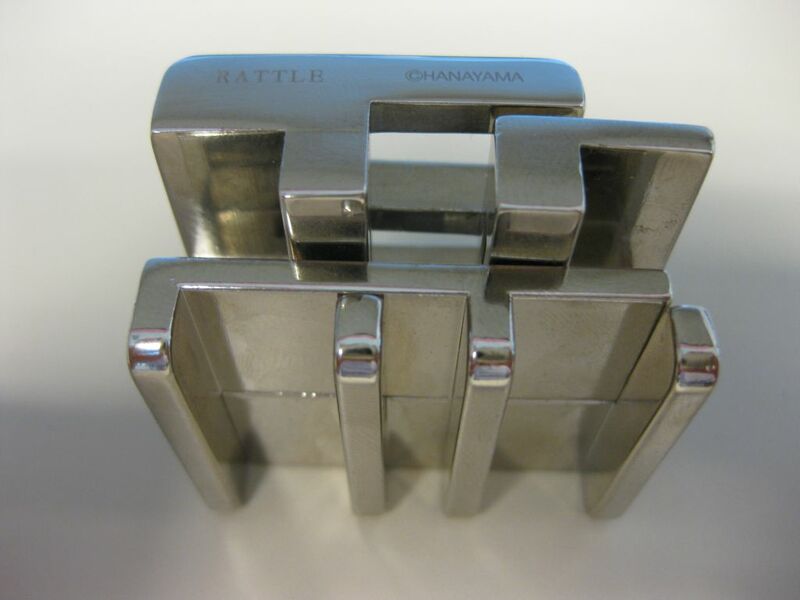 This is listed as an easy puzzle both by Hanayama where it is a 1 on their scale (1-5) and 5 on Puzzle Masters scale (5-10). It is an easy puzzle, but the beauty is that it is designed in such a way that you need to really think about what you're doing to be able to solve it. The obvious way to combine the pieces won't get you a solid loop. Knowing how to solve the puzzle, I found myself idly playing with it, opening and closing the loop without really looking at it. Sitting in long meetings at work, it gave my hands something to do rather than just spinning my pen. This is a stunning puzzle, and is one you really should have in your collection. If you don't already, then go buy this, you'll not regret it! 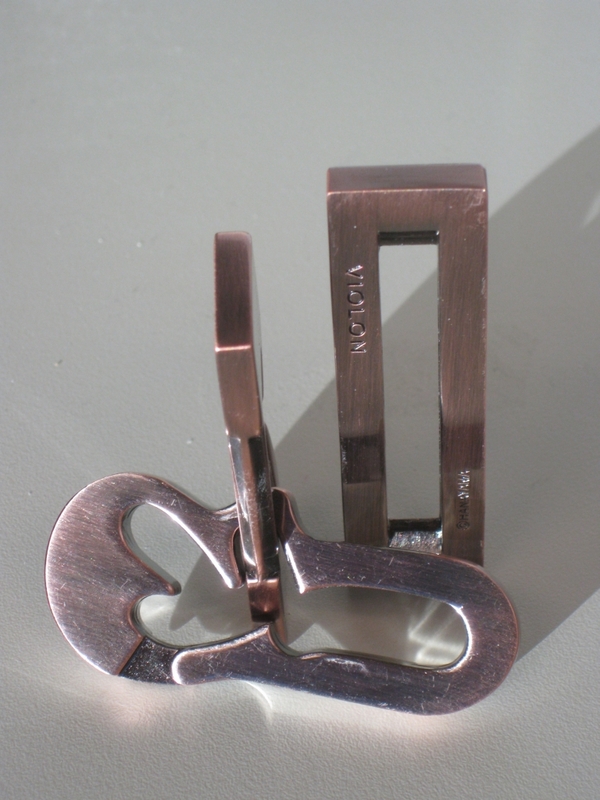 Cast Coil is the newest of the Hanayama cast series of puzzles, and was designed by Edi Nagata of Japan. Thanks to Puzzle Master for sending me this puzzle to review. The objective of the puzzle is to separate the two pieces of the puzzle by sliding and rotating the pieces around each other. At 1 1/3 inches x 1 inch, this is a compact little puzzle, which carries a good weight to it. The Silver and Gold pieces provide a good contrast and make the coil design stand out. There seems to be a rather divided opinion on the look of this puzzle. The aged appearance of the metals used gives it a rough and pitted feel, that many puzzlers don't seem too happy with. Personally, I think it looks great. I really like the aged appearance and think it suits the puzzle. To see what others are saying, read Kevin's review here and Brian's review here. When I first tried to solve this puzzle, the pieces were a VERY tight fit, to the point that quite a lot of force was required to separate the pieces for the first move. That does seem like a temporary issue however as the more the puzzle is played with, the easier the pieces move. Now that I have solved the puzzle many times over, there is a slight gap between the pieces which was not there initially. The first move is still a little stiff, however that helps to keep the puzzle in the starting state, so isn't entirely a bad thing. The two very similarly shaped pieces have a number of notches cut out at strategic points on the inside of the puzzle to allow the square pieces to pass each other. The only real differences between the pieces are the locations of these cut away sections, so keeping track of them can be a little challenging. Initially it took me around 20 minutes to solve this puzzle, as there are a number of dead ends on the path towards the solution. There is one move which still catches me out, and even though I now know the sequence of moves, I somehow manage to get stuck at the same point fairly frequently. Given that most of the moves in this puzzle are rotational moves rather than linear moves, it adds a unique element to the puzzle. The number of possible moves are limited thanks to the shape of the pieces, but rather than making things easier it seems to make things harder as you find yourself wanting to rotate the pieces and being blocked. In all you need around 7 distinct moves to separate the pieces, so once you know the path to take, it can be opened very quickly. I really enjoyed this puzzle, and think it provides just the right level of challenge. Hanayama rates this as a level 3/5 puzzle, and Puzzle Master 7/10 - Challenging, which I have to agree with. I'd highly recommend picking this puzzle up as it's a clever design and a fun puzzle. 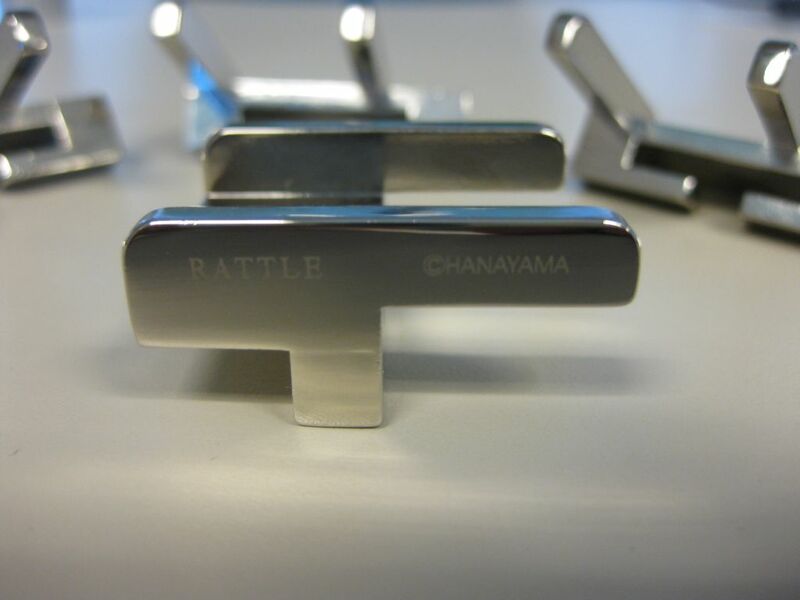 Cast Rattle is another excellent puzzle from the Hanayama Cast series of puzzles. This particular puzzle is designed by Bram Cohen. 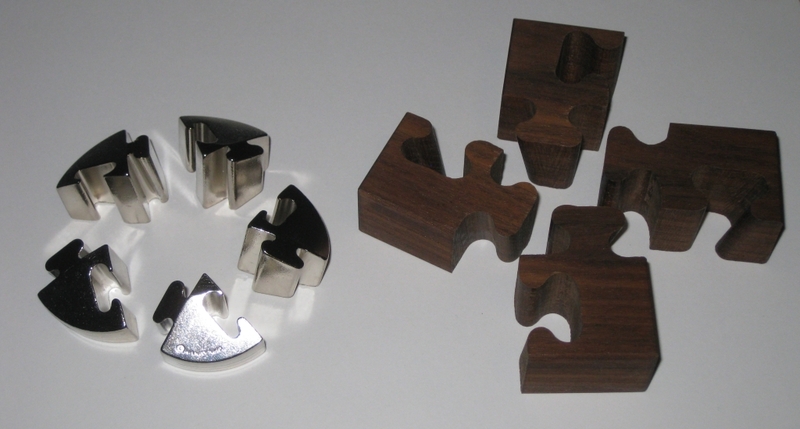 The highly chromed, clinking puzzle challenges you to separate the four joined pieces, then put them back together, before you drive your significant other insane from the rattling. Thanks to Puzzle Master for sending me this puzzle to review. As other people have already commented in their reviews, this puzzle really lives up to its name. The four identical pieces rattle and clink with each and every touch of the puzzle, and most attempts to silence it will prove to be futile. The chromed finish is very slick, and there is very little friction between the pieces to keep them in any particular spot. Have a look at Kevin's review and Brian's review to see what they had to say about this puzzle. If you're familiar with the cast series, then it will come as no surprise to find that the name of the puzzle, and Hanayama's name are laser etched onto one of the pieces. This puzzle is no exception and lives up to the high quality that we are familiar with from the Hanayama series. It's a solid puzzle with a good weight and excellent fit and finish. Despite its small price tag, this is a high quality puzzle. 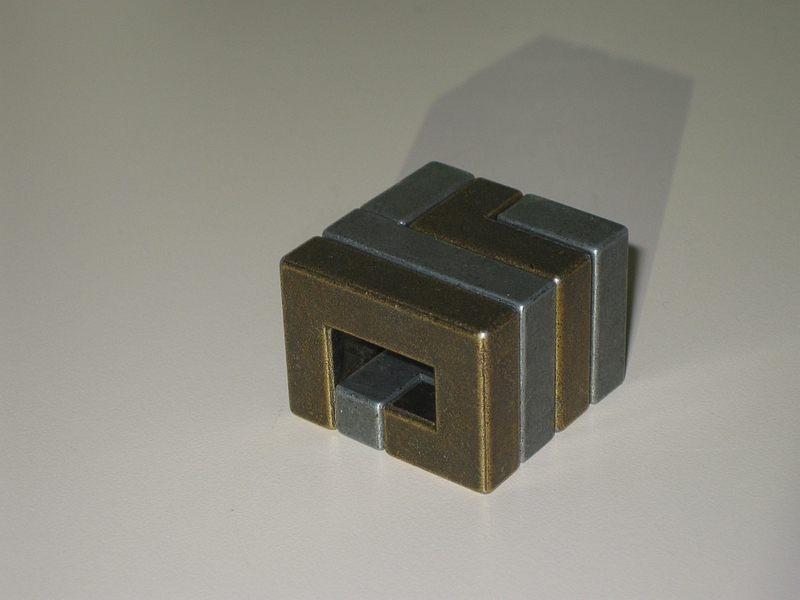 At its smallest, the puzzle is around 1.5" square x 1" high. The pieces fit very loosely together which adds to its tendency to rattle, but there's really no unnecessary movement here. Moving the pieces around in relation to one another, you can see everything, making this another 'perfect' puzzle. You may not realise it, but this puzzle is actually a burr puzzle. Don't let that put you off though. I know that many people are not a fan of burrs but this is a great puzzle and you'd be missing out if you passed it by. The loose connection of the pieces, and the ability to see all parts of the puzzle make this a rather unique burr. Nothing hidden from you and yet something keeps the pieces locked together. With nothing hidden, it should be easy to see how it should open, right? And this is where the frustration sets in. Idly fiddling with the puzzle in your hands is unlikely to see you opening it any time soon. Tugging and pulling wildly at the pieces in the hope they will pop apart also won't yield particularly impressive results. A more structured approach (and a level surface) help in solving this one. You can see from looking at the pieces and how they connect that all you need to do is line the pieces up, and they should fall apart. The beauty is that the pieces are so accurately made, that the alignment has to be spot on for that to happen. I've given this puzzle to a few different people to try to solve, and most have managed. The interesting thing is that each person approaches the puzzle differently, and as such I've witnessed a couple of solutions. The most Neanderthal solution involved holding two pieces and shaking until things fell apart, to the other end of the scale where carefully aligning pieces on a desk and gently repositioning with a pencil until the top two could lift off. Interestingly both were successful! After I solved this for the first time, and could look closely at the pieces when I was re-assembling the puzzle, I noticed something very interesting. That led to what I consider to be a very elegant solution. Taking a couple of tooth picks and carefully placing them between the pieces, you can precisely align them, and separate the pieces with minimal effort. I wonder if this was intentional when the puzzle was designed or just luck! 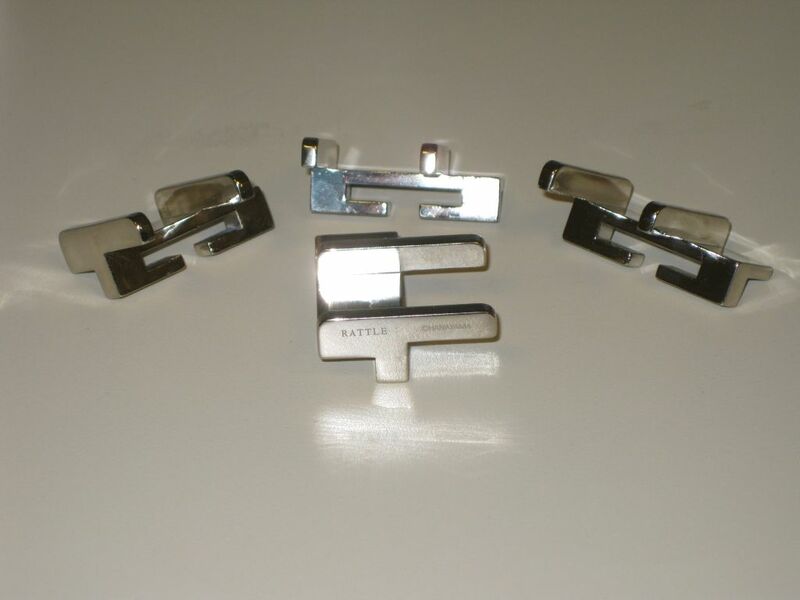 The effect of such a precise construction, and low friction surface is that even when you're putting the pieces back together, almost as soon as the pieces touch, they will move out of alignment locking themselves together again. Hanayama rates the puzzle as a level 4/6 and Puzzle Master a level 8/10 - Demanding. I have to say that these are spot on. It's a challenging puzzle and could keep you rattling away for hours if you don't look carefully at the pieces and their interaction. Even after solving it, and knowing what you have to do, this still provides a challenge every time you come back to it. I highly recommend Cast Rattle for all ages and level of puzzle solving, although I'd suggest not handing it to the baby! Cast Violon is yet another superb puzzle from the Hanayama Cast Series. This puzzle was originally created by Joseph L. Litle in 1965, the Cast version was adapted by Nob Yoshigahara. Puzzle Master kindly sent me this puzzle to review. Cast Violon in the starting state. Nob had this to say about the puzzle. "Patented in America in 1965, this puzzle was originally created by Joseph L. Litle. The idea to make this puzzle came to me after playing with a wooden copy built for me by my close, but now deceased friend, Tadao Muroi. The proportions have been changed considerably from the original plan in this new version. With this puzzle being styled after a violin and its strings, the word here is...'string'. From the top, it's difficult to see the violin shape which gave the puzzle its name, however this side view shows things much more clearly. I really love the aged bronzed look of this puzzle. It suits the style perfectly, and as is normal with the Cast series, it's a heavy puzzle in your hands. The pieces are all solid and well made, so there's no fear of anything breaking or bending as you play with the puzzle. It also seems to have a clear coating over the finish to protect it, which seems to be important as I'll mention later. The body of the violin creates a maze of sorts which the broken loop runs around. 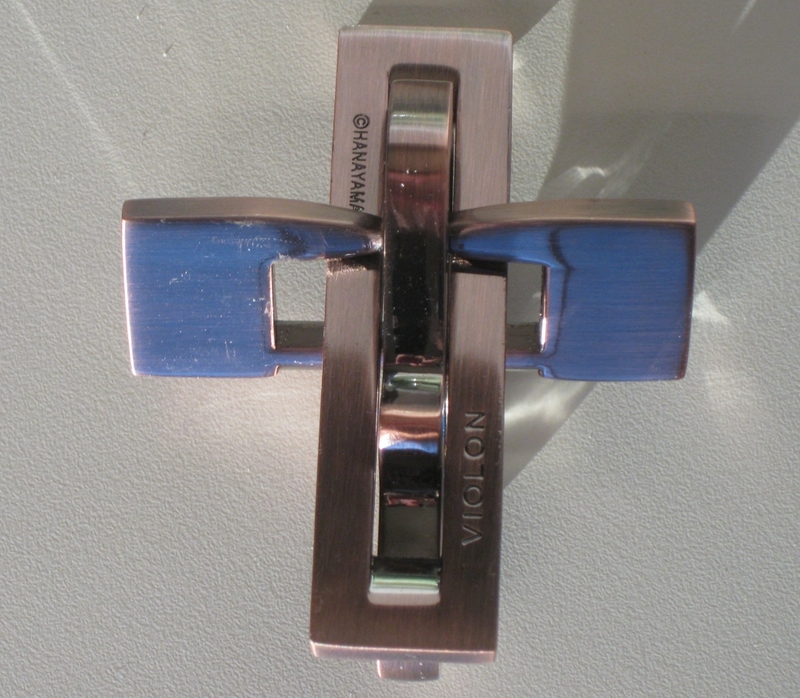 The aim of the puzzle being to remove the rectangular piece with the Hanayama logo and puzzle name from the rest of the puzzle. The thinner section in the violin allows the broken loop to either be fully inside the violin or to run around the outside and it should come as no surprise that a combination of both states is required to solve the puzzle. Have a look at my video review to see the puzzle close up and get an idea for how the puzzle moves. At first look, the exit point isn't entirely obvious, however with a little amount of playing it should become clear where you need to take the 'string' off. Puzzle master rates this as a level 6 - tricky (scale of 5-10), and Hanayama rates it as a 2 (scale of 1-6). I think it's a fair estimate of the difficulty. I was able to solve this in around 5 minutes, and was able to return the puzzle to its starting state in just a few more. The alignment of the pieces when taking the puzzle apart and putting it back together is crucial. If you're off by a fraction, getting the pieces apart or back together becomes virtually impossible. Having said that, I've seen the pieces some apart in a number of different ways and I'm not quite sure how I managed all of them as the pieces don't seem to go back the same was I watched them come apart! Get everything just right though, and the pieces slide together seamlessly. The scratches that have appeared on my puzzle. My only small gripe with the puzzle is that on my copy, the finish has started to become scratched, showing bare metal underneath. 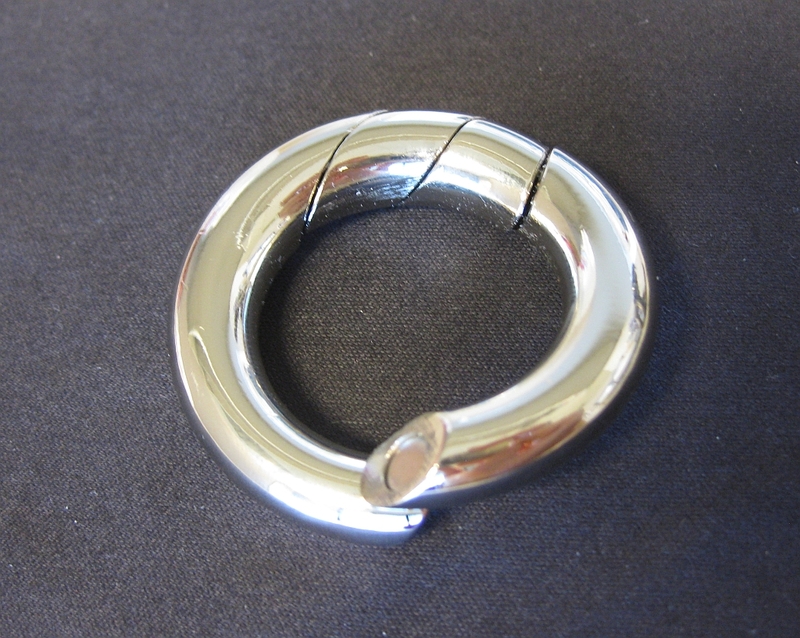 From a distance, you'd never know, and it is minor, however it's not something I expected from a Hanayama puzzle. I think the clear coating that I mentioned earlier just didn't make it onto the section of the puzzle, as there's no issues anywhere else! Overall, this is a nice puzzle. Not tot challenging, and will be able to be solved in a reasonable time by most people who pick it up. If you're still struggling, you can download the solution here. You can't really go wrong with a Hanayama cast puzzle, and this is no different. 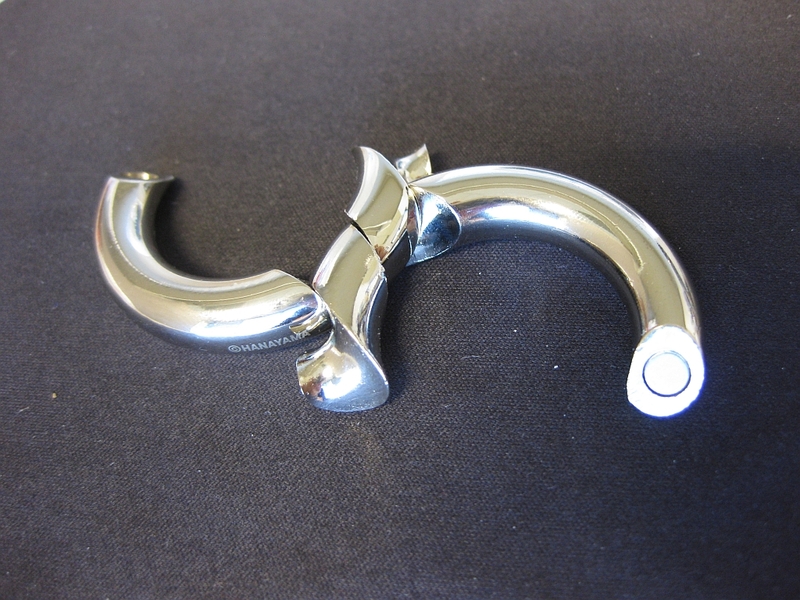 Cast Nutcase is another puzzle in the Cast series from Hanayama designed by Oskar van Deventer. 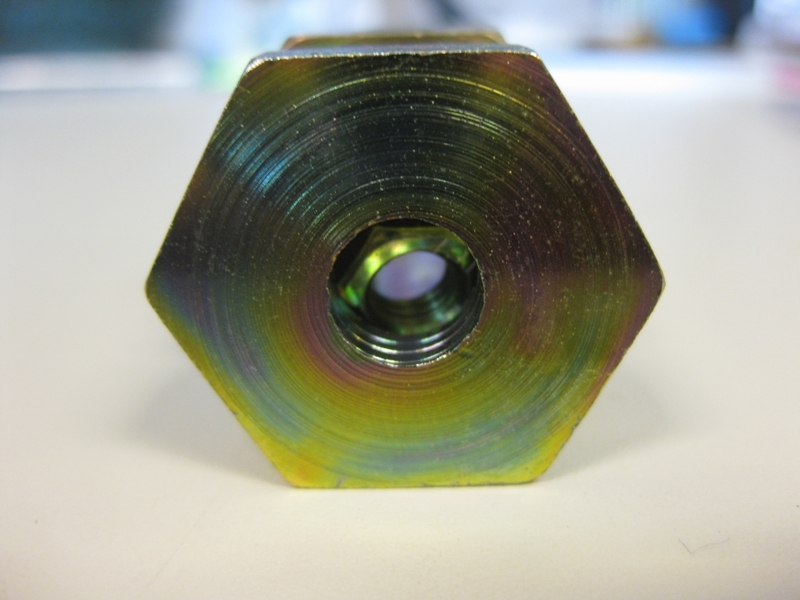 Measuring in at 1.25" diameter, by just under 2" long, the goal is to remove the small nut encased inside the hollow part of the puzzle by taking the two halves of the puzzle apart. Thanks to Puzzle Master for sending me this puzzle to review. As you'd expect, the puzzle comes in the standard Hanayama black and gold packaging, with the puzzle held in shrink wrapped plastic to keep it in place. 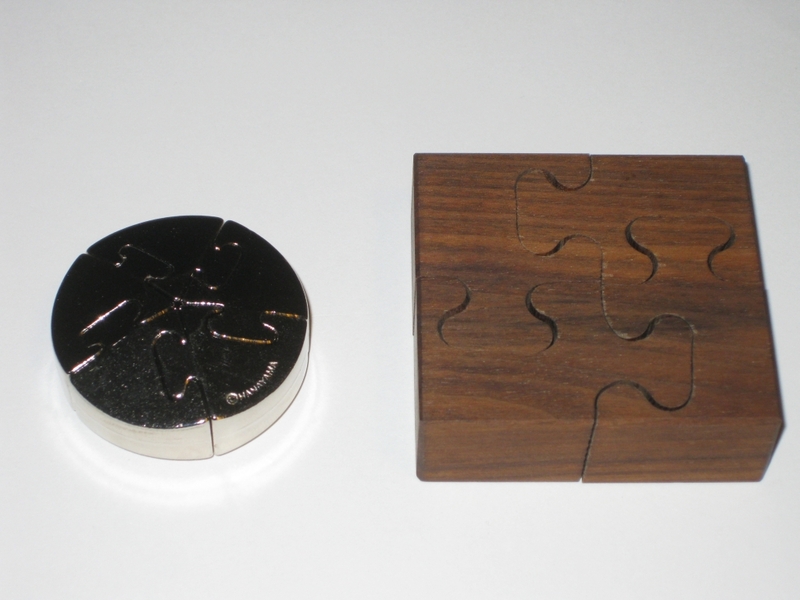 The puzzle consists of 5 pieces, including the small bolt that can be seen through holes in the ends of the puzzle. 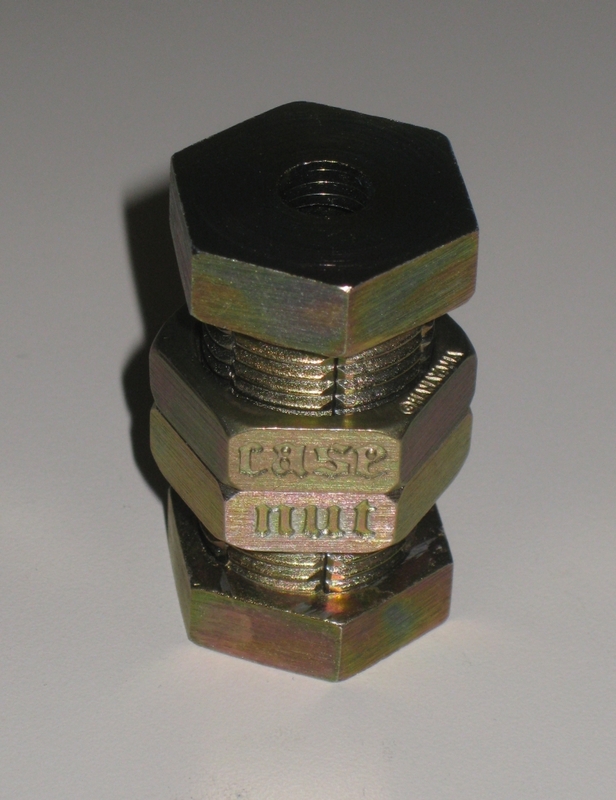 The two bolts threaded onto the centre of the puzzle will spin up and down the threads and each has 'Cast' and 'Nut' engraved into opposite sides of the bolt. 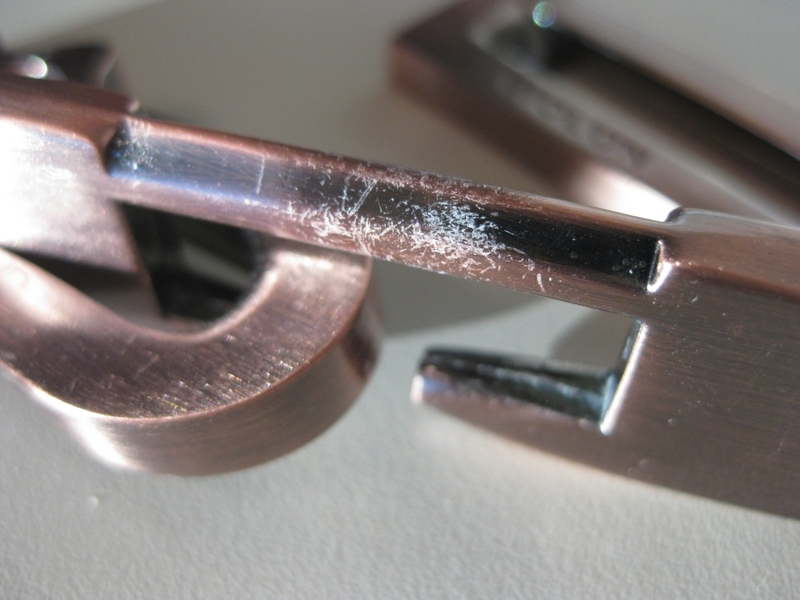 The familiar Hanayama logo is also engraved into the edge of the bolt. The look of this puzzle is interesting as a galvanised, bronzed bolt, with some interesting patina patterning on various surfaces. It may not be the prettiest of the Hanayama puzzles, but it's by no means ugly either. 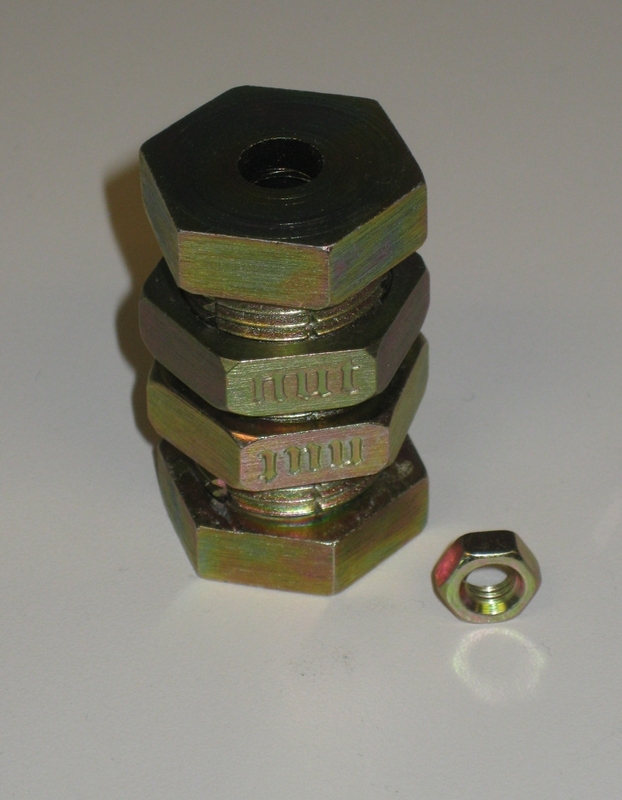 Looking at the puzzle, it seems impossible, as the two nuts in the centre of the puzzle are threaded onto a seemingly full thread which extends from one end of the puzzle to the other. The only clue as to what is going on is that the thread is not made from a single piece of metal, and it split into sections. Pulling on each end of the puzzle will show that the sections are alternately connected to either end of the puzzle, so there is some hope that the parts will separate. Rated as 6/6 by Hanayama and 10/10 - Mind Boggling by Puzzle Master. I have to agree with this rating. It's a tough puzzle and will certainly test you whether you're a seasoned puzzler or not. It took me around an hour to open this one, and even then I think I may have been a little lucky. I could certainly see it taking a lot longer to open this puzzle. You should be able to figure this one out by looking closely at how things are put together, and from that work out what's going on, but there could be a lot of trial and error before you get it opened. If you get really stuck, there's a solution here. For me, this puzzle is a little like picking a lock, and feeling your way around what's happening with little changes to the parts of the puzzle as you go. The small nut free from it's "Nut Case"
My biggest problem with this puzzle is that the nuts don't turn smoothly on the threads if there's any misalignment at all. Given the way that the puzzle opens, and the design on the nuts, this is inherent in the design, and I don't think there's much that can be done to avoid it. 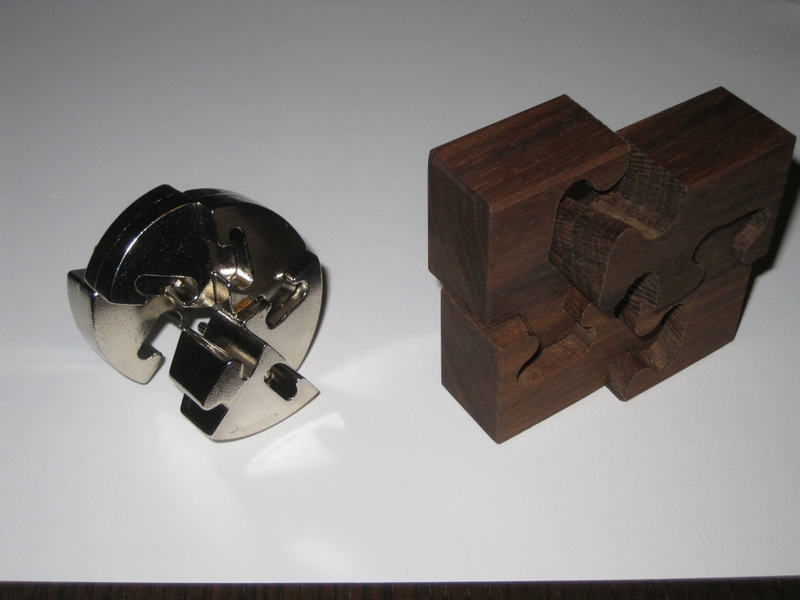 Sadly, I feel that the sticking of the nuts as you turn them does detract from the overall experience, and I had several times where one of the bolts would lock up, and significant banging of the puzzle on my desk was required to get things moving again. Given that very precise alignment of the various parts is required to solve the puzzle, the stickyness does make things less enjoyable. Having solved this a number of times, keeping the threads aligned by pushing together on each end of the puzzle with one hand while turning the bolts helps however that is only useful for the first half of the solution. If things get misaligned, then it's tough to get it back in sync. Overall this is a challenging puzzle, but I fell there's a little too much guess work and hidden trickery to make this a stand out puzzle. If you want a real challenge, then pick this one up, but if you're just looking for a fun puzzle, I'd say it's best to pass this one by. If you think that the first goal is tough enough, then I'd say stay away from the second. Once you've solved it a few times, and you know what's going on, give this a shot. Warning: this is a lot tougher! 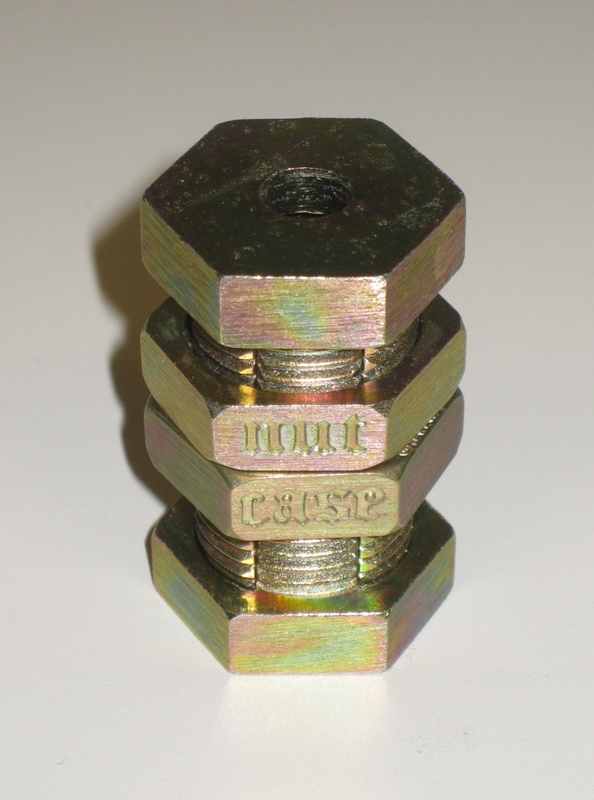 The nuts on the puzzle are designed to go on in one orientation, so that when closed they spell "Nut Case". But it is possible to reverse the orientation so that they spell "Case Nut". The photo above proves that it's possible. Now I will say, make sure you understand how to open it normally before doing this, as all the little markers you've used to solve the puzzle in its first configuration will be of no use to you! When putting the puzzle into this second configuration, things are much tougher, so don't say I didn't warn you. I think this puzzle may just go up to 11! 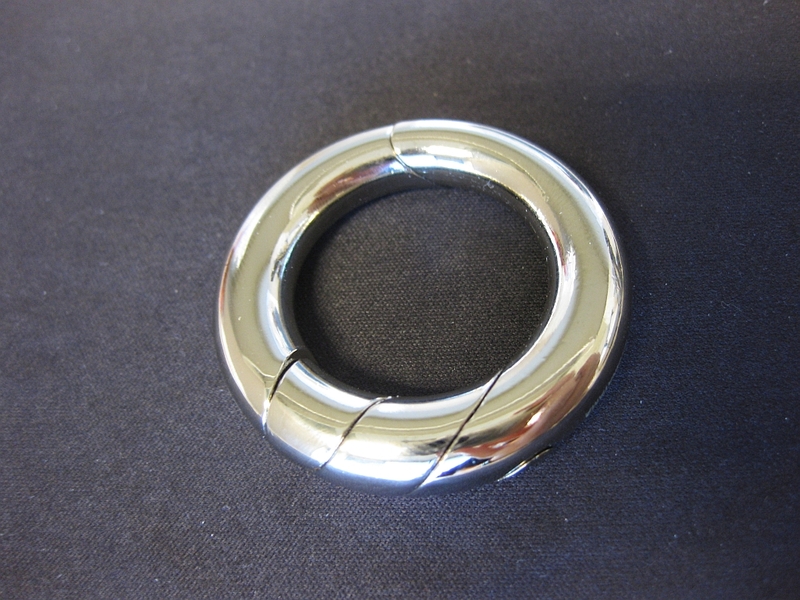 Cast Spiral is another puzzle from the Hanayama Cast series, this one designed by Kennet Walker. This puzzle is similar to a number of 'Jigsaw' puzzles where a small number of apparently identical pieces are linked in a seemingly endless spiral, the goal being to separate the pieces then put them back together. Cast Spiral takes the idea one step further and rather than a 4 piece puzzle, this is a five piece version. Puzzle Master kindly sent me this copy to review. Thanks Puzzle Master! I have a couple of different versions of this style of puzzle, and the wooden version below called Wooden Spiral can be purchased from Puzzle Master. Think Fun also produce a version in plastic called the a-ha! 4 Piece Jigsaw . Both of these puzzles work on the same principle and if you have solved either, then you'll have a good idea of how to approach the Cast Spiral. Cast Spiral and Wooden Spiral side by side. Cast Spiral is a nice progression in this style of puzzle. 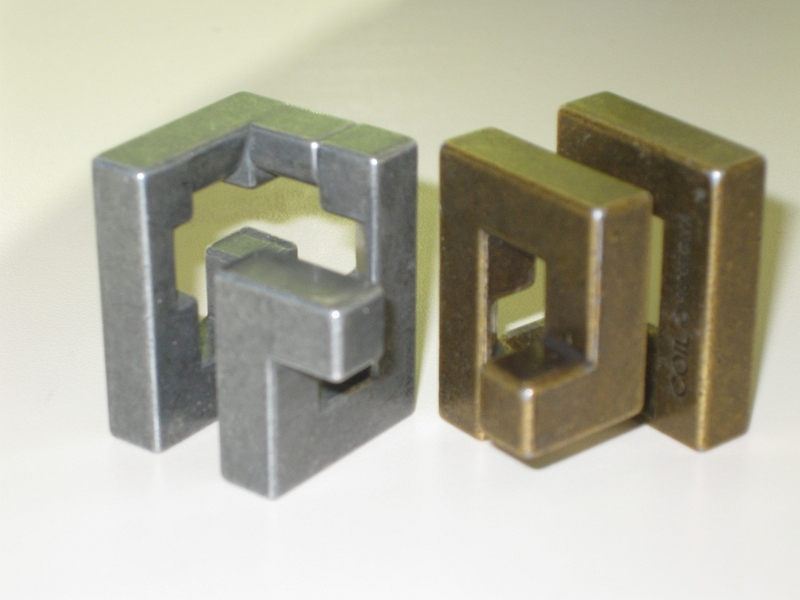 It's a heavy puzzle, and being made from solid metal, you can be quite confident passing this to any of your friends to have a bash at solving it. (Note: No hitting or dropping of the puzzle is required to solve it.) The finish on the surface is plain, but well finished, and bears the Hanayama logo. Given that this is an older puzzle in the Cast series, originally released in 2003, the name of the puzzle isn't on there, unlike most of the newer releases. The shape of the puzzle itself is also interesting. rather than going for a plain cylinder, the pieces taper from the centre to the outside, with a slightly flattened spot in the middle, making for a rather pleasing shape, that leaves the puzzle looking as though it's floating above the table. Side view of Cast Spiral and Wooden Spiral showing the spiral nature of the pieces. As you can see from the side, it looks as though there's no way to separate the five pieces of the puzzle, however as I mentioned earlier, the solution to this puzzle has its roots in the jigsaw style puzzles I've already mentioned. Unlike the wooden or plastic four piece versions, the pieces of Cast Spiral are not all identical. So just picking it up and using the trick you already know isn't going to work. You're going to have to find out how to implement the trick, which adds a little extra challenge if you're familiar with this style of puzzle. Hanayama rates this as a Level 5/6 puzzle, and Puzzle Master a Level 9/10 - Grueling. I think it's fair to say this is a tough puzzle, however it's perhaps only a 4 in Hanayama's scale given that there's a number of tougher puzzles been released since this one. It's nice that even if you know the solution to one of the four piece puzzles, that it's not going to instantly work on the Spiral, so it may catch a few people out. If you've not come across one of these before, then it's a tough puzzle, but a fairly enjoyable one at that. If you're really stuck then you'll find a solution here. Like the other Cast puzzles I've already reviewed, I highly recommend adding this to your collection. It's a really solid puzzle, with a nice twist in the solution. None of the cast series are overly expensive so really there's no reason not to own one! To see what everyone else is saying about these puzzles (yes, seems everyone else has reviewed this before me), have a read of the reviews by Allard, Brian, Jerry, Kevin and Oli.